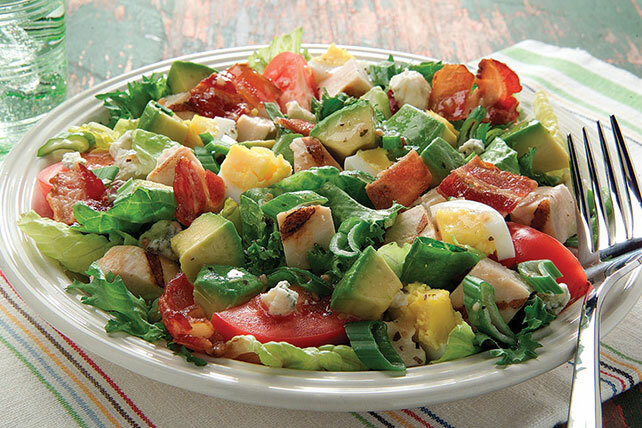 This Classic California Cobb salad recipe is simply delish and takes just 20 minutes to make. Serve it at your next dinner along with your favorite dishes. Toss avocados with lemon juice; place in large bowl. Spoon onto salad plates; drizzle with dressing. Serve this salad as your meal for a quick-and-easy lunch or dinner. Prepare using 1 pkg. (2.1 oz.) OSCAR MAYER Fully Cooked Bacon, chopped.